Residents in New Jersey and New York are still trying to cope with rebuilding efforts after the storm. BREEZY POINT, N.Y. -- Thousands of New York and New Jersey residents displaced when Superstorm Sandy barreled ashore one year ago are still fighting with insurance companies, slogging through red tape and waiting for government aid – and many still aren’t home. The storm, which made landfall in the U.S. last Oct. 29, killed an estimated 160 people here and dozens more in the Caribbean, according to the National Hurricane Center, and inflicted billions of dollars in damages. More than 650,000 structures across the region, including some 366,000 in New York City and New Jersey, were impacted by Sandy. The state of rebuilding in the region varies. In some hard-hit neighborhoods, there are empty lots where homes once stood. Storm-wrecked residences stand vacant with “for sale” signs outside. Some families forge ahead with the often slow, costly construction process, with some living in their partially repaired homes. And others who lack the resources to rebuild, including those battling for insurance money or waiting for government aid, are still shacking up with relatives or living in temporary apartments. Kieran Burke, 41, is living with his family in an apartment in Yonkers, N.Y., about an hour’s drive from their home in Breezy Point. For much of the last year, Burke said he fought to obtain the building permits and insurance money necessary to rebuild his Breezy Point bungalow, one of nearly 130 that burned in fires sparked by Sandy’s floodwaters. Burke said he has received almost his entire insurance payout and expects to get the permits soon, but he is reeling from the frustration he experienced along the way. 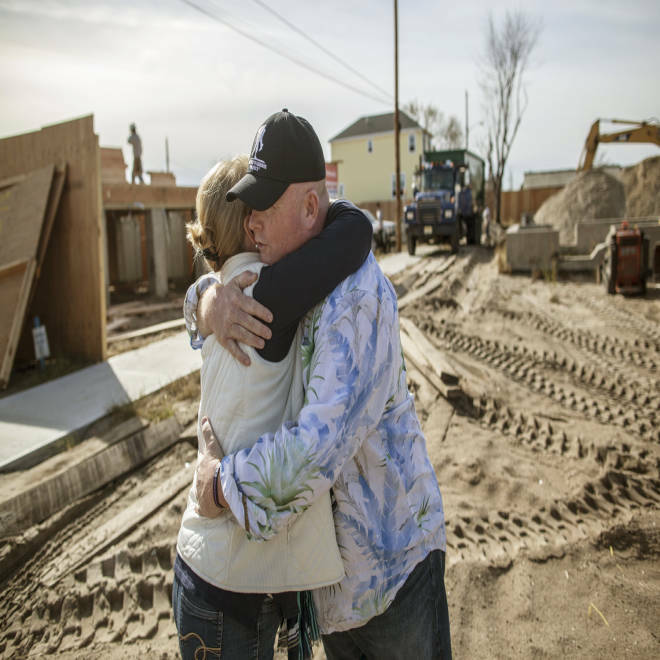 Kieran Burke of Breezy Point, whose home burned down during Superstorm Sandy, hugs his neighbor Kathy Lutz. For most of those still displaced by Sandy – which includes at least 27,000 households in New York and New Jersey, according to state and local officials – money is the major barrier to getting home. The Federal Emergency Management Agency provided more than $1.4 billion in assistance to more than 182,000 disaster survivors in five states, including New York and New Jersey. But states have been slower to supply key $150,000 to $300,000 federal grants, provided by the U.S. Department of Housing and Urban Development, to individual homeowners facing funding shortages as they rebuild. For now, some Sandy survivors still see no path home. In Union Beach, N.J., a tight-knit community ravaged by Sandy, entire blocks once filled with homes are mostly empty. On two vacant lots, handmade signs express anger at insurance companies for not paying up. On a recent Saturday, Joe and Lori Argentina surveyed the sinking foundation where their home once stood. Sandy’s floodwaters swept their five-bedroom residence of nine years 200 feet away through wetlands abutting their property. “It’s a year of nothing. Nothing,” said Joe, a 68-year-old retiree now sharing a one-bedroom bungalow in Union Beach with Lori, 50, and their two young daughters. Another daughter, in college, is expected to return home soon after she graduates. The couple has no money to rebuild, saying their bank pressured them to use their flood insurance check to pay off their mortgage. They quickly accrued debt, making them ineligible for a federal government loan pegged for disaster victims (they were twice rejected). Lori, a paraprofessional for the New York City education department, said the family’s last resort was a $150,000 HUD-funded state grant. She applied when the program began in late May and received preliminary approval in early July but doesn't know how much they will receive or when. “We’re just stuck in limbo,” she said, with no back-up plan for rebuilding or leaving their cramped bungalow. Joe said he visits the old neighborhood at night, sitting and looking at the water. “It's heartbreaking,” he said. Construction crews are at work in Breezy Point, New York, a small beach community where over four hundred homes were damaged by Superstorm Sandy. One year after the storm set off fires and flooding, cement trucks are pouring new foundations and framing crews are aiming to finish more than a dozen new houses before the winter sets in. 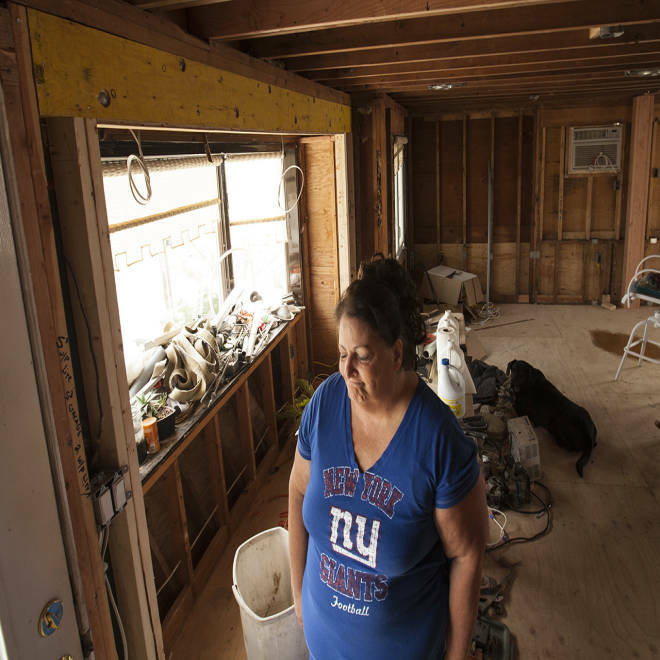 About one hour south in Manahawkin, N.J., Jackie Terefenko and her husband, Mike, have run out of funds to complete work on their partially repaired home. They elevated their two-story residence to nearly 14 feet to comply with new FEMA building guidelines, but have encountered many setbacks, including a wall pulling away during the lift and part of the second floor sagging. “We have all these problems on top of problems,” said Jackie, 59, who was diagnosed with lymphoma after Sandy tore through the house they bought in 1964. They live on the second floor, using their bathroom as a makeshift kitchen with a toaster oven and hot plate, and they eat at a card table in their bedroom. The first floor remains stripped to the studs without insulation, heat or electricity. The Terefenkos need more money to build steps to the front door and finish the first floor, including the kitchen, bathroom, walls, new doors and windows, as well as hook up the electricity. But a new problem has emerged: The front wall is bowing out. “We’re living in hell,” said Jackie, who has a box and bag full of paperwork and receipts that chronicle their rebuilding. The couple is fighting for more funds from their insurance company, which paid $84,000 of a $250,000 policy, Jackie said. So far, they’ve spent $139,000 – a sum cobbled together from the insurance money, their savings and government aid – but Jackie estimates the price tag will surpass $220,000. The couple is waiting to hear if they’ll receive one of the HUD-funded state grants. “They’ve got all that money, but where’s it at?” Mike said of their predicament. The process is so overwhelming, said the couple, that like many others in the community, they have been in counseling since the storm. “We honestly couldn’t handle what was happening to us,” Jackie said. 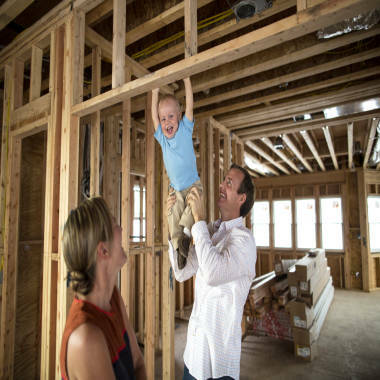 Michael and Elizabeth Carlson, with their son Michael Jr., visit their new home under construction in Breezy Point, which they hope to be able to move into by Christmas. Back in Breezy Point, the outlook is much brighter for Elizabeth and Michael Carlson, who are among a rare group of Sandy survivors: They soon will move into a newly rebuilt home, one constructed in compliance with the updated federal guidelines. In the past year, the family has moved three times with an infant (Michael Jr., now 18 months), waited months for new federal construction guidelines for their flood zone and fought with their insurance company, an ongoing battle, Michael said. The family managed to rebuild using money they’d saved to renovate their modest bungalow, which was condemned after four feet of water raged through it during the storm. They’ve also received some insurance money and have taken out a loan from the Small Business Administration, though they’ll still have to cover the mortgage on their former bungalow. The Carlsons, who hope to move into their new home in mid-December, are the first family among their closest neighbors to rebuild from scratch, and they hope it motivates others. Nearly 40 homes are now being rebuilt in this community, which lost 350 residences to the storm and fire. Passers-by “have said to me that it’s kind of inspiring for the neighborhood, that it’s signs of coming back,” said Michael. “It’s a breath of fresh air, because for a while, we weren’t sure what was going to happen to this community.” About 60 percent of Breezy Point’s 2,800 homeowners have returned since Sandy hit, said Artie Lighthall, general manager of the private community’s cooperative. The Carlsons aren’t planning to commemorate the first anniversary of the storm, though it does coincide with Elizabeth’s 34th birthday. “It’s time to just move forward,” she said.